Visit Our Showroom A complete line of parts & accessories in our showroom. All-Aluminum Construction We offer the highest quality trailers... at the lowest prices! Choose Your Colors! 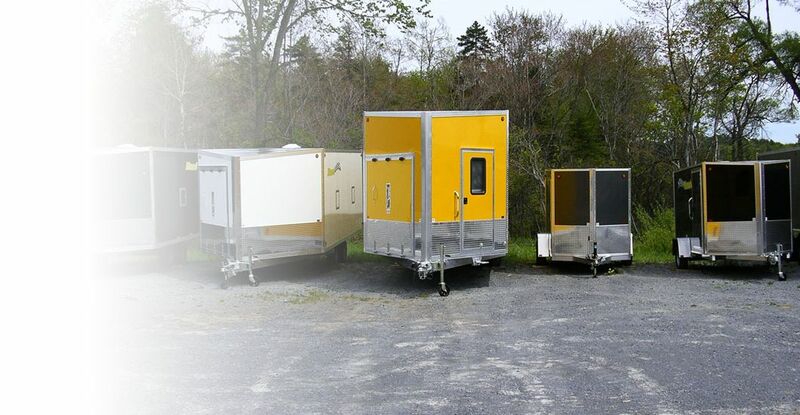 Trailers are available in 14 various colors to match your vehicle, with many in stock! All Types of Trailers We manufacture ALL types of trailers to transport ALL your toys! 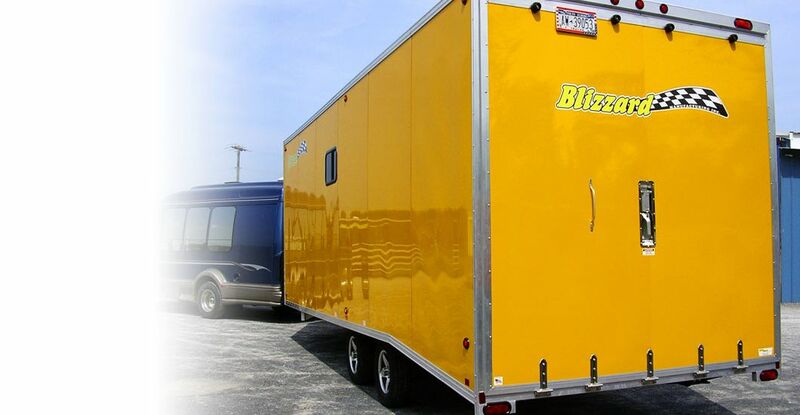 Blizzard Manufacturing is an All Aluminum trailer manufacturer located in upstate New York. We have built our business on high quality and workmanship. Our trailers are made with a heavier frame construction, a roof truss bow system and have a completely sealed exterior which are all signature features of Blizzard trailers. We step it up with interior finished walls, recessed camlock latches and diamond kick plate which come as standard features. We can customize a new Blizzard trailer at our manufacturing plant in Boonville to meet our customer's recreational or business needs. Stop in and meet our friendly and knowledgeable sales staff and service team. "There may not be snow, but you can still have a BLIZZARD!! When you place your order for a Blizzard Trailer model this is where the customization begins. We don't use the "cookie cutter" method of trailer sales, we build your trailer to fit around your needs. While you can purchase trailers right off our lots, many Blizzard clients prefer the option to have us "tailor build" their trailer to fit their specific needs. Customizing doesn't necessarily mean "additional costs." 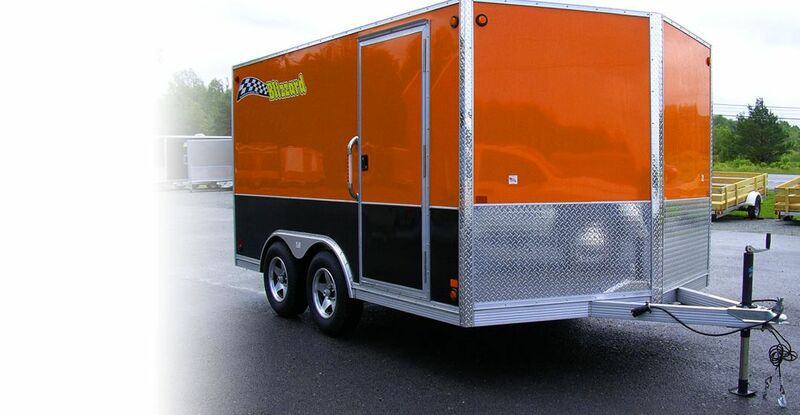 When you place your order for an enclosed Blizzard Trailer model, placement of standard features like man doors, fuel doors and ramps will be installed to your specifications. Color selection and location of siding when ordering dual-colored models like our Blizzard LowBoy motorcycle trailer is another area of customization that falls within our standard features zone. Change out the anodized aluminum trim with diamond plate, swap out the incandescent trailer lights with high visibility LED lights, or add Blizzard Mfg. custom accessories like diamond plate helmet shelves or salt shields. Does your Blizzard Trailer need to carry tools and parts that need to be secured while in transit? Let our trained sales staff assist you in configuring your new trailer to be functional the moment you pull out of our lot. While there are many optional accessories available directly through Blizzard Mfg., we will install items provided to our staff that clients provide. Cupboards and counter tops, shelving and appliances are but a few items that Blizzard clients have provided for installation. See photos below of a recent food concession trailer recently completed for a client. Click on the provided links to trailer customization projects for a closer look. We'll be adding more in the near future. Blast Boss - open car hauler with V-Nose box. All-Aluminum Lightweight, strong, corrosion resistent & holds its value. Custom Built Built to your specifications. 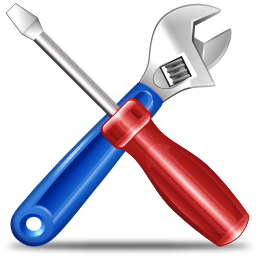 Parts & Repairs Available on location to keep you on the road! 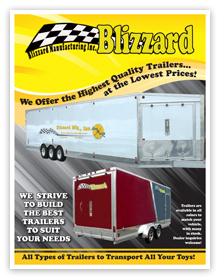 Click on our 6-page Blizzard Trailer brochure thumbnail to open a printable PDF file of our trailer models. 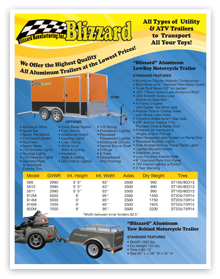 Click on our 4-page Blizzard Trailer brochure thumbnail to open a printable PDF file of our ATV, Motorcycle and Utility trailer models. Standard Features that come as "extras" on competitor models, set Blizzard Trailers apart and at the top in purchase value. With an excellent strength-to-weight ratio, Aluminum provides us with a resilient foundation to produce demanding products. Aluminum's inherent corrosion resistance helps combat the damaging effects of winter. Did you know Blizzard Mfg. repairs ALL makes and models of trailers? 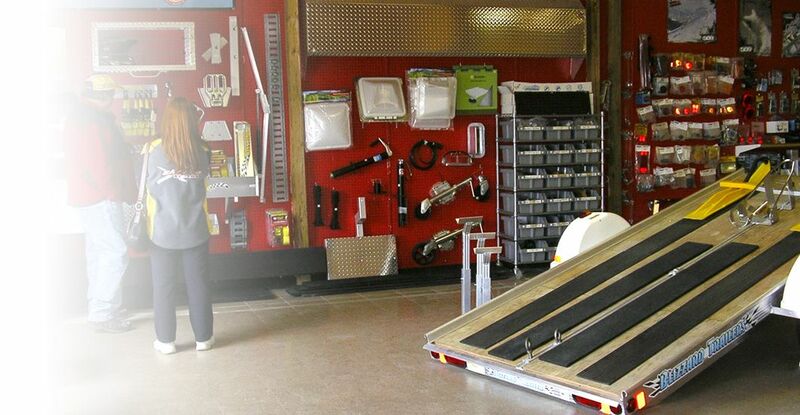 Make sure your trailer gets fixed right the first time, bring it to us!